Has anyone ever mounted their sink in a table wing? I plan to have a table wing for the added counterspace, then I thought why not two. On one mount the sink, that way I don't loose space in the galley. Perhaps that coupled with a hot water on demand. Yes, as a matter of fact, someone on this board did. Gage might have the link...................he's so darned good at that sort of thing! Caught this double setup at Minden. Last edited by Chris C on Wed Apr 05, 2006 4:32 pm, edited 1 time in total. (THAT's where I saw it!) Thanks Dave. Looks very doable to me! 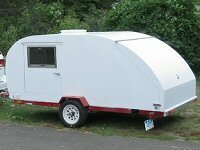 Looks good and a great looking teardrop. You got any more view of those spun hubcaps? Check with Lazybones for the hubcaps. He has them on his TD to match his car. Looks sharp. That was a really nice trailer. I am considering mounting my sink like that as well. On the other "wing" he had his camp stove with home built oven. I was looking in the latest Harbor Freight sale flyer that ends 4/24/06. Wonder if these would work better than the legs in the pictures above? Seems like these would be more stable? Thanks for sharing the snappys! Last edited by Loader on Thu Apr 06, 2006 7:39 am, edited 1 time in total. On the front of that TD, what do you think those two little open windows are for? Do you think they cover the AC exhaust, and he opens them when the AC is in use? And Earl, did you follow that thread about the Oster unit, which is basically identical to the Hot Water on Demand but a lot cheaper? The height issue can be solved with a few short lengths of pvc pipe slipped over the legs too raise the working surface to a comfortable level. It's a trick I've used many times at bbq comps to save my back. I know its the photographer, and not the camera. I'll keep shooting with a Pentax. Just in case. Great minds think alike! I was just thinking about a side table sink last week. I am just not comfortable about having a water supply in my galley and the space it would take up. There are two modifications I would make from the picture shown. 1) Generally I camp at locations that have at least a water connection. I would configure my faucet to be fed from the campsite water connection via a garden hose. 2) I would construct a drain from the sink made from a hose or pvc pipe to drain the grey water into a five gallon bucket. What do you think? Or what other ideas do you have? You also might want to look at Madjack's teardrop. His leg support goes directly to the trailer..................so if the trailer is level, the table wing will be level.